The boggy half of Caithness and Sutherland is known as the Flow Country (from the Old Norse word Floi meaning marshy ground). If you were to dig down about 7 metres you would touch peat that is 7000 years old. It might not look that interesting, but in fact there are lots of birds here and many types of plantlife, so really it is very rich in that respect. This part of Scotland is becoming very busy due to the increasing popularity of the North Coast 500 (NC500) route which is listed in many top travel sites and guides as one of the best touring routes in the world thanks to the variety of scenery and experiences it has to offer. North West Highlands Geopark - it rocks if you love geology! Not to mention whisky distilleries, golf, seafood, local crafts, and much more. If this isn't enough, you can also get the ferry to explore the Orkney Isles. John o'Groats - it's the ultimate photo opp to say you have been there! The main Citylink coach route is from Inverness up the A9 and then west to Thurso/Scrabster for the Orkney ferry. It takes just over 2 hours to drive the 120 miles. See the Scottish Citylink website with timetables. Stagecoach Buses also operate buses on this route and many others in the area (north and west). The Durness Bus offers local services including a weekly Durness to Inverness route via Thurso (Saturdays only). There is a Monday - Friday service from Durness to Lairg. Private hire of this minibus can be arranged. Transport for those on the Cape Wrath Trail can be arranged. Tel: 01971 511223 / Mob: 07782 110007. If you want to get from Inverness to John O'Groats, then take the Orkney Express which runs direct every day 1 June to 31 August 2019. The coach from Inverness connects with the ferry at John O' Groats and you can travel on to Kirkwall (Orkney). travelinescotland.com is the official public transport guide with online timetables and a journey planner. Taxi between John O' Groats and Inverness - tel: 01862 842260 / 07734700319. Ideal for start or end of sponsored cycle rides, etc. The railway line runs from Inverness up through Golspie, Brora, Helmsdale and Wick to Thurso. Buses connect from Thurso station to John O'Groats. Wick airport has direct flights to/from Edinburgh, Aberdeen, Shetland and Orkney. There is also an airport at Inverness. The The North Highland Way is a long distance walking trail of 150 miles (241 km) from Duncansby Head in the north east corner of Scotland to Cape Wrath in the north west corner via Thurso, Tongue and Durness. It can be completed in 10 or 13 days. The Cape Wrath Trail web site provides info on the trek from Fort William to Cape Wrath (almost 200 miles). The Moray Firth Trail is an interesting network of footpaths and trails which includes walks near John o'Groats, Wick, Helmsdale, Brora, Golspie, Dornoch, Tain and many other places. The Cape Wrath Challenge takes place in May. John Sutcliffe had the idea for the Cape to Cape Walk from Cape Cornwall to Cape Wrath (1250 miles). There's a book and the web site is very good. Caithness Seacoast - based at Wick harbour marina. 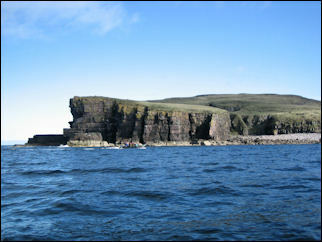 Tours of the east Caithness coast onboard a twin engine RIB. Disabled access to the boat and toilets available. Open all year. See castles, harbours, lighthouses, wildlife, sea caves and stacks. Rides can be 30 minutes or longer. Tel: 01955 609200 / Mobile: 07747 404128. NorWest Sea Kayaking - bases in Ullapool, Achiltibuie and Lochinver. Tel: 07900 641860. Highlands Unbridled (based near Brora in Sutherland) offers pony trekking (1 hour to 1 day), beach rides and coast-to-coast trail riding holidays. All ages and abilities. Friendly qualified staff. Accommodation can be arranged. Tel: 01408 622789. Based in Ullapool, North-West Frontiers organises guided walking holidays in Caithness and Sutherland. Many people take up the challenge of travelling between Land's End and John o'Groats (LEJOG). If you are cycling, you might like to use the services of A Ticket to Ride which is a bike hire company which also has a bike taxi service. Tel: 01463 419160 or 07902 242301 out of hours. The places listed on this page take you on a tour up the east coast along the A9 main road from Dornoch (which is some 45 to 50 miles north of Inverness) to John O'Groats and then westwards along the very top of northern Scotland to Cape Wrath which is the most north-westerly point on the British mainland. From there, this tour continues down through Sutherland and Assynt towards Ullapool and Wester Ross. You can also cover this route in the opposite direction - I don't think it really matters which way you go! The views are spectacular especially the further north you are. You could easily spend a week here and still not want to go home. Don't forget you can also go over to Orkney which is well worth it if you have time. Caithness & Sutherland are key areas of the popular North Coast 500 route (a 500-mile circuit around the northern Highlands which begins and ends in Inverness and also features Ross-shire. It is also worth also heading inwards away from the coast by taking the road from Lairg, across the moors and forest, up through Altnaharra to Tongue (single-track road in many places). There's a hotel and restaurant at Altnaharra and the Crask Inn is in between there and Lairg. The mountain scenery is spectacular - this is something of a remote wilderness. Along this route, Lairg is the main centre of population with shops, accommodation, garage, railway station, etc. Pay a visit the Ferrycroft Countryside Centre and if you are interested in archaeology, follow the trail up Ord Hill to see burial mounds, chambered cairns and hut circles. Held in mid-June, the Lairg Music Festival is open to local competitors. Lairg Gala Week usually starts on the second Saturday in July. The Lairg Crofters Show is held on the third Saturday in August. For Scottish tweeds, visit the Sutherland Sporting Company. From Lairg you can see the vast expanse of Loch Shin. Southwards, follow the road and river down to Achany and The Falls of Shin where the salmon leap between June and September. Although the original visitor centre was destroyed by fire in May 2013, the new community-led attraction opened in spring 2017. The Falls of Shin Visitor Attraction comprises a pavilion, gift shop and cafe. The kids playpark, salmon leap viewpoint and woodland walks are also open 7 days a week. Tel: 01549 402888 / 07923 951568. On the A9 north of Inverness, this old county town is where the last witch was burned in Scotland (in 1722). Dornoch has free public WiFi thanks to Highland Council. Log on with your social media details or by entering your email address. Madonna made the town famous in December 2000 when she stayed at at nearby Skibo Castle for her wedding with Guy Ritchie. They christened their son Rocco in Dornoch Cathedral, which dates from the 13th century and is open daily during daylight hours. The town is home to the Royal Dornoch Golf Club, the most northerly first-class course in the world I believe. Local facilities include shops, chemist, hairdresser, banks, filling station, tennis courts, bowling green, sandy beach. Visit Historylinks at The Meadows for an exhibition of Dornoch past and present (open Easter to October, daily 10am - 4pm). In Castle Street, Cocoa Mountain has a cafe and shop with its own hand-made chocolates and hot chocolate. Tel: 01971 511233. The Dornoch Castle Hotel can be booked for accommodation and weddings. Events in town include the Beltane Fire Festival (May), Dornoch Book Fair (mid July), Dornoch Highland Gathering (early August), Dornoch Festival Week (mid August), Whisky Festival (October), community Bonfire and Fireworks (early November), St Andrew's Fair (early December), as well as community markets (certain Wednesdays on the cathedral green), car boot sales (monthly from April to October). The Dornoch Pipe Band plays most Saturday evenings at 8pm in the square (from the end of May to early September). For more info, visit the Dornoch & District Community Association. For detailed tourist information about the town consult visitdornoch.com. Several nice walks can be started here. The town has a swimming pool, sandy beach, railway station, bank. On Main Street, Lindsay & Co. is one of those traditional shops which sells just about everything (tel: 01408 633212). Golspie golf club. On the hill you can see the 100-foot statue of the 1st Duke of Sutherland (erected in 1834). Seat of the Earls and Dukes of Sutherland, this beautiful castle with a French influence sits looking out across the North Sea and is well worth a visit. With 189 rooms, it is the largest house in the Northern Highlands. Parts of it date back to the 1300s. There are many collections of furniture, pictures, objets d'art, uniforms, china and family memorabilia on display in the Drawing Room, Library, study, bedrooms, nurseries, etc. Visitors to the castle can also see a 19th century horsedrawn fire engine in the Sub Hall and look at the museum which is housed in the old summer house. The formal gardens were laid out in 1850 by Barry, the architect who built the Victorian extension to Dunrobin and also the Houses of Parliament in London. The castle is open every day from 1 April to 15 October. Admission charge. Limited disabled access to the house. Tel: +44 (0)1408 633177. There is a gift shop and tea room offering light meals & snacks. 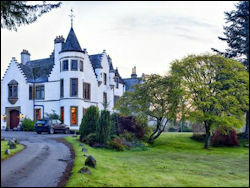 For details of private tours, facilities for functions and opening hours, see the official web site: www.dunrobincastle.co.uk. Highland Games are held at the castle usually in August each year and other events are hosted there from time to time. The Vintage Car Rally takes place in August. Sandy beach, golf course, railway station, chemist, filling stations, bank, and visitor centre at Clynelish Distillery (open Monday - Friday from Easter - October, rest of year by appointment only). Pandora's Emporium is an usual shop on the edge of Brora. It is full of vintage, retro and classic clothing, shoes and accessories, as well as local pottery, photos, etc. Tel: 01408 622562. 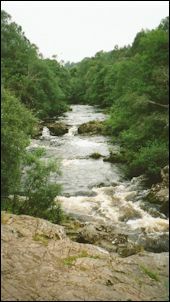 The local river is famous for its salmon. Near Strathsteven south of Brora is a well preserved Iron Age broch called Carn Liath. Nearby Highlands Unbridled offers horse trail riding. Tel: 01408 622789. Once a busy herring port, now the site of the Timespan Heritage Centre (open daily Easter to October) which has life-size displays, an audio-visual presentation and nice garden with a cafe. From here the railway line turns inland and returns to the coast at Wick. Shops, bank and hostel. Strath Ullie Crafts is the Visitor Information centre located on the harbour next to the riverside car park. Closed Sundays. The Helmsdale Tackle Company Ltd shop in Dunrobin Street has all you could possibly need to go fishing. Tel: 01431 821372. 'The Emigrants' statue in Couper Park was commissioned by Clearances Centre Ltd to commemorate the Highland Clearances. The Helmsdale Highland Games take place in August in Couper Park (tel: 01431 821666). Visit Helmsdale.org for local info, accommodation photos, news, etc. Nine miles west of Helmsdale is Kildonan Burn, the site of the Great Sutherland Gold Rush of 1869. Today you have more chance of finding fossils and gemstones on the shoreline than gold in the hills - but you can always try your luck! Gold panning on the Suisgill Estate is free but you must adhere to their rules. Equipment is available from the Strath Ullie Crafts & Visitor Information in Helmsdale. Click here for gold panning info. Pretty village sitting in a valley. Puffins can be seen here in early summer. Birthplace of Highland author Neil M. Gunn - memorial and nearby picnic area. Heritage centre in the former school where Gunn began his education. Open daily 10am - 5pm from April to October. Small admission charge. Tel/fax: 01593 731233. Visit the Dunbeath Heritage Centre and Trust web site for more info. The local harbour was a busy place in the olden days when as many as 150 fishing boats went out searching for herring. Nearby attractions include the Laidhay Croft Museum (tel: 07563 702321), several brochs and walks. Highland Games in August (phone 01847 821763 for exact date). Dunbeath Castle is about a mile south of the village. The castle itself is privately owned and not open to the public. Dunbeath Castle Gardens are open by appointment throughout the year (Monday - Friday, last entry 3pm.). Tel: 01593 731308. Well behaved dogs on a lead are welcome. Entrance fee £6 per person (includes light refreshments and cake/biscuit in the potting shed). The Clan Gunn Heritage Centre and Museum is in the old 18th century village church. Open 11am-4pm Monday - Saturday from 1 June to 30 September. There are 77 septs associated with clan Gunn (e.g. Georgeson, Henderson, Jamieson, Johnson, Nelson, Manson, Robison, Robson, Sandison, Swanson, Williamson, Wilson) - so visit and see if your family name is one of them. Tel: 01593 741700. From here you can cut across country on the new section of the A9 to Thurso/Scrabster (see further down this page) for the Orkney ferry, or continue northwards up the coast to Lybster, Wick and John o'Groats. Harbour, golf course, Celtic cross. Bank. Visit Waterlines at the harbour - the exhibition centre run by Lybster Heritage Trust. Heritage and wildlife displays, video to watch and a CCTV console with remote control through which you can watch birds on the cliffs. Coffee shop. Open daily May to September 11am - 5pm. Telephone 01593 721520. Take the little road inland just north of the village and after 5 miles you will reach the Grey Cairns of Camster. You will have to crawl if you want to get inside these chambers which are 5000 years old. North of the village on the main A9 road you can visit the Kyleburn Confectionery factory. Near here is the Hill O' Many Stanes which features rows of early Bronze Age stones (link to photo by Diego Meozzi). Further up the A9 road at Ulbster is the Cairn of Get which is 24m long and 14m wide. Not far from here is the road to the Whaligoe Steps which lead down the cliff to a small harbour. These 365 steps are very steep and dangerous even in good weather, so take care. A local lady used to look after them because she was convinced that God, being a fisherman, would come here one day. The steps are not well signposted, so at the telephone box on the A9 (map reference ND320405) take the minor road to the left. Drive past the houses, park at the end of the road, take the path round the big house, then descend the steps and prepare to be impressed. Old herring port where Robert Louis Stevenson spent his childhood. Wick Heritage Museum is open Monday - Saturday from Easter to end October. The town includes shops, filling station, railway station, airport, hospital, banks, golf club, Tourist Information Centre. Wick has free public WiFi thanks to Highland Council. Log on with your social media details or by entering your email address. Castle of Old Wick or Castle Oliphant: these 14th century ruins are 1.5 miles south of Wick. Castles Sinclair and Girnigoe (3 miles north of Wick) both built on the edge of the cliff are now in ruins. The Clan Sinclair Trust has all the info. On the way to John o'Groats you can visit the Caithness Broch Centre in the old school at Auckengill (open April - September). Admission free. Telephone: 01955 631377 / 01955 607034. Although situated at the end of the road heading northwards, it is not quite the most northerly point on the British mainland as many people believe. 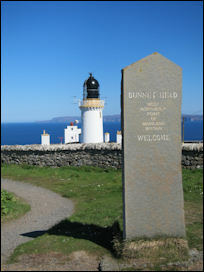 That honour goes to Dunnet Head, some 15 miles to the west, not that it stops all the tourist hype. There are several souvenir shops here, one of which boasts to be the "First and Last Shop in Scotland". You can have your photo taken by the signposts which indicate that Land's End is 876 miles away and London a mere 690. Tourist information centre. Toilets. Hotel. Museum (open Easter - October). visitjohnogroats.com has full details of local facilities. 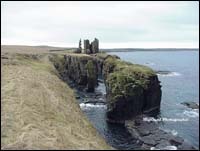 You can walk to Duncansby Head and see stone pinnacles rising out of the sea. There's lots of birdlife in the cliffs and also a lighthouse. You can go on a wildlife cruise every day from 20 June to 31 August in the afternoon for 90 minutes to see the local birds and seals. Organised by John O'Groats Ferries, Ferry Office, John O'Groats, Caithness KW1 4YR. Tel: 01955 611353 / Fax: 01955 611301. Trips over the Pentland Firth are also available to Orkney. Two tours around the main sights on Orkney are made each day. Take a look at the John O'Groats Ferries website for full details. 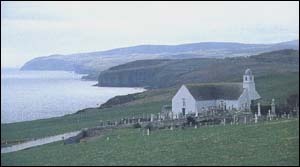 The Medieval church of St. Drostan contains a tombstone commemorating the Groot family which gave its name to John O' Groats. Departure point for the vehicle ferry service to Orkney which began in 2001. Pentland Ferries offer 3 or more sailings every day this summer. Booking advisable. Tel: 01856 831 226. Located between Thurso and John O'Groats, it looks out to sea across the Pentland Firth. 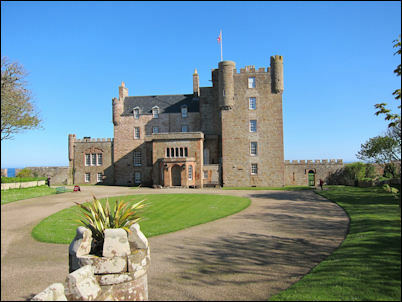 Built as a Z-plan castle between 1566 and 1572 by the fourth Earl of Caithness, it was bought from Captain Imbert-Terry by the Queen Mother in 1952 (after her husband died). The castle was then in a state of disrepair and renovation work was required. In September 1996 she handed the castle, its 2000 acre estate and her prize-winning herd of Aberdeen Angus over to a charitable trust to make their future secure. The gardens were one of her favourite places and it is said that she often used to head straight to them on arrival during her annual August and October visits. For 2019, the Castle and Gardens will be open to visitors daily from 1 May to 30 September from 10.20am until 4pm (last admission) but will be closed from 24 July to 5 August inclusive. To double check times and dates, visit the official web site. Several of the guides in the castle will tell you personal stories of their time with the Queen Mother. Visitor centre with tearoom, toilets and gift shop. The Mey Highland Games are held nearby in early August. This includes traditional Highland Games events such as piping, Highland Dancing, tossing the caber and putting the shot, as well as the tug o'war final which is usually umpired by HRH Prince Charles (the Duke of Rothesay as he is known in Scotland). Check out the Royal Gallery at the Castle Arms Hotel in Mey and see their collection of photos of the royal family. The most northerly point on the British mainland. Views across to Orkney on a clear day. Dunnet Head Lighthouse was built in 1831 by Robert Stevenson. There is also a seal viewing point. Mary Ann's Cottage, just by Dunnet, has been virtually untouched in the last 150 years. Worth a visit to step back in time to see how people lived in those days. Nowadays, Mrs. Mary-Ann Calder's former home is in the care of the Caithness Heritage Trust. Open from 2pm to 4.30pm Tuesday - Sunday, June - September. Tel: 01955 603385 to confirm. The Castletown Heritage Society web site has details of local history and the heritage centre. For lunch, dinner or snacks, try The Highlander Restaurant at Castletown (Tel 01847 821018). This old Norse settlement became an important trading place and is still the most northerly town on the Scottish mainland. Thurso has free public WiFi thanks to Highland Council. Log on with your social media details or by entering your email address. Harald's Tower just outside the town is the 18th century burial place of the Sinclair family of Ulbster. Leisure centre, cinema, golf course, restaurants & take-aways, supermarkets, banks, pharmacy, hospital, filling stations, churches, beach. Car and cycle hire. The Bike Shop on High Street - tel: 01847 895 385. Thurso Pipe Band are the most northerly band in mainland Britain. Great waves for surfing can be experienced at Thurso reef. The Caithness County Show takes place in July at Scrabster Farm, Thurso (tel: 01847 851654). Originally founded in 1821 by William Smith, the original distillery fell into ruin and the new one was built in 2012. It lays claim to being the most northerly distillery on the Scottish mainland. Tours are available Monday to Friday at 2pm. Visitors are welcome on weekdays from 10am if you want to buy a bottle (it closes at 3pm in winter, and 4.30pm in summer). Tel: 01847 891 051. This fishing port is the vehicle ferry terminal for Orkney. You can walk along the cliffs of Holburn Head. The Caithness Agricultural Show takes place here in July I believe. There are several places to eat and drink including the Captain's Galley which is a highly recommended, award-winning seafood restaurant (tel 01847 894999). The local Scrabster web site includes a webcam, live weather station, ferry updates, news, photos, etc. Now being decommissioned. There is a visitor centre which you can visit for free daily 10am-4pm from May to September. Telephone: 01847 802 233 to check exact dates and times for this year. Wonderful beaches. When the crofters were forced off the land in the nearby glen and told to live by the sea, they founded what is now the village of Bettyhill. The Strathnaver Museum is housed in the old parish church and tells the story of the Highland Clearances, local history and clan Mackay (open April - October). Toilets and coffee shop. Tel: 01641 521418. Mackay Country web site has lots of useful information about all the villages and places to visit around here. Filling station, bank, youth hostel, hotel. Lovely views from the causeway out to sea and the so-called Rabbit Islands. 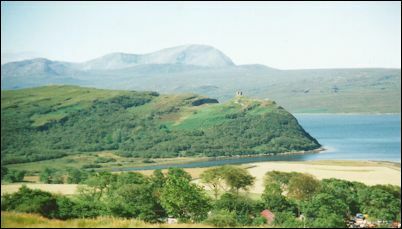 Approaching Tongue from the south, you can see the ruins of Castle Varrich or Caisteal Bharraich. Sitting on a promontory, this is an old two-storey tower-house owned by the Bishops of Caithness. 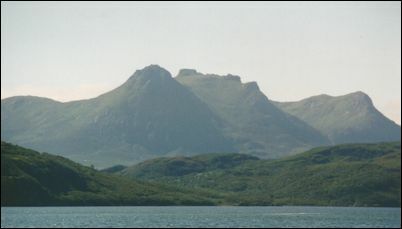 Looking inland from Tongue you have spectacular views of Ben Loyal and the surrounding mountains. Heading west from Tongue you take the long trip around Loch Eriboll, the deepest sea loch in the country, nicknamed Loch 'Orrible by Navy personnel during World War 2. There are several spectacular sandy beaches all around here. Outside the Durness Tourist Information Office you will see an arrangement of large local rocks. These are huge specimens showing the variety which can be found in the local area. Inside the building have info on the local wildlife and some of the guided walks to Faraid Head. The village also has a youth hostel, campsite, filling station, grocery, gift shop, bookshop, post office, etc. The Durness Highland Gathering take place in late July. The village hall garden is the site of the John Lennon Memorial (the ex-Beatle spent many childhood holidays here). Nearby is Balnakeil which is the site of a former Ministry of Defence Early Warning Station, now used as a craft village which includes the Loch Croispol Bookshop & Restaurant (open daily from Easter to the end of September, and Monday - Friday the rest of the year). Also check out the Cocoa Mountain coffee shop which sells hand-made chocolates and their own hot chocolate (open daily in summer, and some days in the winter). Tel: 01971 511233. Continue to the end of the road and you will come to the ruins of Balnakeil Church which contains the carved tomb of local murderer/robber Donald Macleod who paid for his tomb to be inside the church to protect his remains from his enemies. You will also find the tomb of Rob Donn MacKay, one of the great 18th century Gaelic poets. The church is thought to have been founded by Saint Maelrubha in the 8th century. Opposite the church is Balnakeil House. At Ceannabeinne beach (2.5 miles from Durness) you can take the zip wire from 37 metres up on the cliff tip (travelling at up to 40mph). Open Easter to October, 10am - 6pm, weather dependent. Contact Golden Eagle Zip Lines (tel: 01971 511404). Around the corner you will see the golf course which is the most northerly one on the British mainland. Park your car by the church and take a walk from here along the lovely beach. You can continue through the dunes and along the headland to see puffins on the cliffs during the summer. Head towards the cairn on top of the small hill before you reach the MOD establishment and you will find that the views looking back inland are spectacular. On a clear day you can see right along the northern coastline of Scotland, almost right across the country to the east coast. Visit the Durness community web site for more information about all the things to do and see around this beautiful part of the world. There's a heritage walking trail to the old township of Ceannabeinne which was cleared in 1840s but the ruins remain. 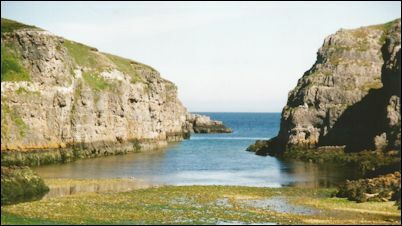 Smoo Cave is located 1 mile east of Durness. There is a car park and toilets at the top of the cliff. A path leads down the cliff and then you can walk across to the cave entrance. It is open all year free of charge. This limestone cave is 200 feet long, 50 feet high and over 100 feet wide. There is a wooden walkway into the waterfall chamber. If you want to venture further inside, you can get a guided tour (April - September) which includes further access via a river raft (contact Colin on 01971 511704). The most north-westerly point on the British mainland. To reach it you need to take the passenger ferry at Keodale near Durness (Tel: 07719 678 729 / 01971 511 246). This operates from May to August with a crossing time of 10 minutes. Bicycles can be carried on the ferry if you prefer not to take the bus. Services can be subject to delays when the military range is in use. Minimum number of passengers for the ferry is 4. Then you go on the minibus (Tel: 01971 511 284 / Mob: 07742 670 196) which takes 40 minutes to drive the 11 miles to the lighthouse and Ozone Cafe (tel: 01971 511314). To the east of the Cape Wrath lighthouse built in 1827 by Robert Stevenson is the pretty bay of Kearvaig and the highest sea cliffs in mainland Britain. If you are energetic and want to camp in the wilderness, you can trek into and/or out of the Cape Wrath area, but you will certainly need hillwalking experience and proper equipment as this is rough and remote terrain. Also make sure that you check with the local tourist office that there is no military activity planned on the range. Driving south from Durness and Keodale, you will pass the towering mountains of Cranstackie and Foinaven. At Rhiconich you can detour down a small road to Kinlochbervie, a fishing port and fish market with craft shop, post office, grocery store, petrol station, hotel and art gallery. MV Nimrod is a charter boat which sails out of Kinlochbervie (tel: 01971 521359 / 07736 157326). The Free Spirit Trekking Centre offers pony trekking - tel: 01971 521320. From Kinlochbervie, continue along the scenic road to the beach at Oldshoremore. Shortly after that the road ends and a track begins to Sandwood Bay - very remote and scenic, only for fit walkers (10 mile return trip). Once you are back on the main road (A838) heading south from Rhiconich, you will reach Scourie with its craft shops, general store, filling station, post office, public toilets, caravan park, etc. Also look out for the herd of Highland Cattle on your way into the village. You may also spot a palm tree or two! This island (owned by Dr. Jean Balfour) is a bird sanctuary managed by the Scottish Wildlife Trust. It has spectacular cliffs and birdlife - you can see puffins at certain times of the year. Visitor numbers are strictly limited. 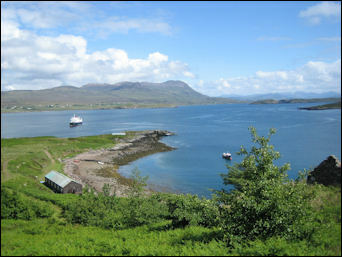 To land on the island, you will need to take the Handa Ferry from Tarbet (by the seafood restaurant). Regular summer service Monday to Saturday. Crossings are weather dependent - contact Roger Tebay (07780 967 800). On your arrival, a warden will show you the 6 km path to take around the island (see walk details). Allow at least 3 hours to explore it all. You might also spot dolphins, porpoise, whales, etc. The Handa Island Skua Project has been running since 2003. Handa had a population of 65 people in 1841, but the potato famine of 1848 caused the de-population of the island. Continuing south on the A838, you will see the many islands dotted in Eddrachillis Bay and then pass through the Duartmore Forest. Towered over by the mountains, the new bridge at Kylesku replaces an old ferry at this point. Boat trips operate during the summer months to take you up Loch Glencoul to see Eas a'Chual Aluinn, the highest waterfall in Britain (nearly 200 metres). All sailings are subject to weather conditions. Booking recommended. Tel: 0792 114 9086. Alternatively you can hike to see it - but at 2 hours' walk over rough terrain to get there, this is really only for the experienced hiker. Even if you have missed the boat, it is still worth following the signs from the main road to go down to the pier where you'll see the Kylesku Hotel and public toilets. You can get a nice view up Loch Glendhu. 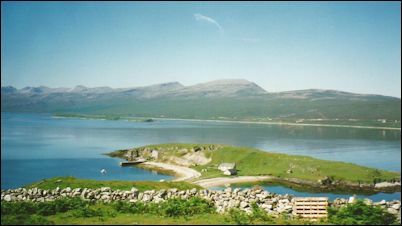 The Kylesku Hotel offers good food (restaurant and bar meals) and accommodation. Recommended in the Michelin Guide to Eating out in Pubs. Open from March to mid October. Tel: 01971 502 231. On the north side of the Kylesku bridge is a memorial cairn to the men of the XIIth Submarine Flotilla who trained in local lochs during World War II. These midget submarines (X-craft) played a vital part in the war. Half a mile south of Kylesku you will find the Maryck Memories of Childhood Museum with a large selection of dolls and dolls houses, plus a tea room at Unapool (tel: 01971 502009 or 01971 502341). Open daily from Easter to October. The Rock Stop Coffee Shop and Exhibition for the North West Highlands Geopark is at Unapool in the former primary school. Hot and cold drinks, books, gifts, home baking, WiFi. Open 11am - 4.30pm, 7 days a week. Tel: 01971 488765. Just after Unapool, the road branches in two. You can either continue down the main road towards Ardvreck Castle and Elphin (see below) or you can detour via Lochinver, then drive past Quinag to join up with the main road by Ardvreck Castle - or then again you could continue along the coastal road heading down via Inverkirkaig to explore Achiltibuie and return via Stac Pollaidh to the main road. If you want to do justice to this area, I would advise at least 2 days - or more if you intend climbing any of the many glorious mountains! The coastal road between Kylesku & Lochinver is rated as one of the 10 best most picturesque drives in Scotland in Peter Irvine's Scotland the Best guide book. Busy fishing port with Spar supermarket, newsagents, bank, filling station, post office, public toilets, craft shops. Check out the Lochinver Larder restaurant and deli on the main street - homemade pies, sandwiches and takeaway meals as well as a sit down menu. Also in Main Street is The Caberfeidh Bar and Restaurant which offers good food and drink, and is popular with locals and visitors alike. Open daily (tel: 01571 844 321). Peet's Restaurant on Culag Road by the harbour serves locally produced food and fish fresh from the boat (tel: 01571 844085). 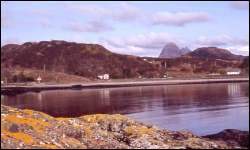 Lochinver is also home to the Highland Stoneware factory shop which is on the north side of the loch from where you can get the classic shot of Suilven the 'sugarloaf' mountain towering over the village. The shop is open weekdays 9am-6pm (all year) and 9am-5pm on Saturdays from Easter to October. They produce hand-painted pottery (gifts and table/cookware). Tel: 01571 844376. The Assynt Highland Games take place at Culag Park, Lochinver on the second Saturday in August. 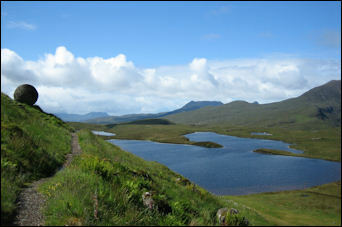 The Sutherland Way Trail is a long distance walk from Lochinver to Tongue. As mentioned earlier, you can detour along the coastal roads both north and south of Lochinver. Along the road heading north out of Lochinver, there are many interesting stops including the detour to the beach at Achmelvich - this offshoot of the road is a little hair-raising (best if there is no oncoming traffic!) but well worth it as you can see from the picture below. There is a ranger hut, open during the summer, plus public toilets, and a caravan/camping site all set back from the beach so as not to be intrusive. Shortly after rejoining the B686 and not far from Pollan, you will come to a lovely viewpoint (assuming it is a clear day!). Displayed before your very eyes you will see across the horizon mountains from Conival and Canisp, to Suilven, Cul Mor and Cul Beag. Maybe more if you look closely! Further north there are more beaches around Clachtoll which boasts an usual Split Rock formation in the sea and an Iron Age broch towards Stoer. You can drive to the Stoer lighthouse which has views right across to the Hebrides. From here there is a walk across open moorland and cliff tops to the Old Man of Stoer, another rock stack formation in the sea. More bays at Culkein and Clachnessie, followed by another interesting viewpoint at Drumbeg (also more public toilets for those of you with weak bladders). From here you can look northwards to Handa Island and also Ben Strome. Drumbeg Stores has local arts & crafts, as well as Highland products and its own label Drumbeg whisky. They are winners of the Best Village Shop in Scotland award. Tel: 01571 833235. You can sit outside and enjoy the view over Loch Drumbeg. At the east end of the village, The Little Soap & Candle Company has a gift shop and a secret tea garden (open Sunday - Friday from 1 April to mid/lateh October). This is also the start of the Peat Road walk (a 4 - 5 mile circular walk around Loch Drumbeg). The Assynt Foundation was established following the community buy-out of the Glencanisp and Drunrunie Estates in 2005. 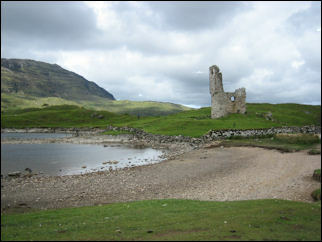 Back on the main A897 road between Unapool and Elphin, the lonely ruins of Ardvreck Castle sit on Loch Assynt. Well worth a stop if you would like to walk over and explore (but please do not clamber over the building as it is a listed ancient monument). Details and photos are available on my Ardvreck Castle page. Historical connections with the Mackenzies and the Macleods. Probably built around 1590/1. The ruins of 17th century Calda House (owned by the Mackenzies) stand by the roadside. Visit Historic Assynt and Discover Assynt for more details about both places. On the main road heading down to Ullapool, you will pass through the area known as Inchnadamph - highly significant for geologists and home to the famous 'Bone Caves' where bones of polar bears were discovered dating from the last Ice Age. Be sure to visit Scottish Natural Heritage's Knockan Crag interpretative centre with toilets and picnic area. It tells you all about the area. There are 2 circular trails for different abilities. This (photo on right) is the view from one of the trails where you can see some great pieces of artwork made from stone. Due to its outstanding geology and landscape, NW Sutherland together with parts of Wester Ross was designated by Unesco as Scotland's first Geopark. More information is given by the Assynt Geology web site. Just south of Ledmore Junction where the road branches towards Lairg, you reach Elphin, home to the Highland Rare Breeds Farm, not to be confused with the other farm attraction right next to it! Tea room in the centre of the village. Also check out the Swallow Studio. The road heading south out of Lochinver towards Achiltibuie is certainly worth the detour if you have the time and are not put off by driving on narrow, twisting lanes. This birch-lined road passing by gushing rivers is quite an experience and you will also have a couple of sea views (if you dare take your eyes off the road ahead). Signs at either end of this road warn that it is unsuitable for caravans and coaches, so that will give you some idea of what it is like! Along this road and not far from Lochinver is Inverkirkaig which is home to Achins book shop (probably the most remote one in the country!). It includes a coffee shop (tel 01571 844262). The path to the waterfall leads from the side of their drive. Be warned - it isn't a gentle stroll - it may take you around 2 hours to get there. This is also the path which later leads up Suilven. Click here for walk directions. You can reach Achnahaird either by continuing south from Inverkirkaig along the road I describe above, or you can branch off the main north-south road (now the A835) between Elphin and Ullapool and take the unclassified road past Stac Pollaidh (click for my photos) which is another popular hike. Once at Achnahaird, follow the signs to the beach and park at the end of the road. Take the path heading right and you can easily walk to the sands. There's also a caravan and camping site here. On the approach road to Achnahaird from the east you will have grand views of the mountains to the north (weather permitting!). There is also a viewpoint on the road from Achnahaird to Reiff - you will see the marker on the hilly headland. Continue along the road heading down to Achiltibuie and the Summer Isles will come into view, and, depending on visibility Wester Ross and possibly Skye, as well as Harris and Lewis. The Achiltibuie Garden (previously known as the Hydroponicum) is open Monday to Friday from 11am - 1pm, and 2pm - 4pm (tel: 01854 622202). Achiltibuie is also home to the Summer Isles Foods (fish/meat/game smokehouse), hotel, Coigach craft & gift shop (tel: (01854 622346), Achiltibuie stores. 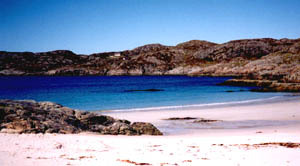 Visit Coigach.com and Achiltibuie.com for more local info, accommodation, etc. The Coigach Geotrail is a good way to explore the landscape and geology of this area. Boat cruises giving you an hour ashore on the Summer Isles run Monday to Saturday during the tourist season. Cruises on the M.V. Isabella depart from Badentarbert Pier (Achiltibuie) 3 times a day from May to September. Booking is essential as the boat is only able to take 12 passengers per trip. Contact Ian MacLeod - tel: 07927 920592. Evening fishing trips also available. Visit the Summer Isles web site for more info about Tanera M�r and its famous private post office. The island is now under new ownership. This photo (right) shows the wooden building (post office/cafe) overlooking the bay. You can leave Achiltibuie on the road alongside Loch Vatachan to get back to Achnahaird and then continue on your merry way. Driving south down the main road you will shortly reach Ullapool and Wester Ross. B&B prices from £99 per person. opposite the Cathedral where Madonna was married. Close to the Royal Dornoch golf course. 1 hour's drive north of Inverness. Garden Restaurant with AA Red Rosette for excellent food. including some with four-poster bed. B&B prices from £80 per person. with grounds and extensive views towards the Cromarty Firth. Once the family seat of the Mackenzie clan. Built in the early 1800s. AA 4 Stars & 2 red rosettes. Elegant restaurant, lounge and bar. Choice of dining in the bar or restaurant. Conveniently situated on the main A9 road near Invergordon. 25 miles north of Inverness. 20 miles south of Dornoch. Recommended by Cond� Nast Johansens & Michelin guide. Choice of 15 indivually styled ensuite bedrooms. tea & coffee, toiletries. Free WiFi. 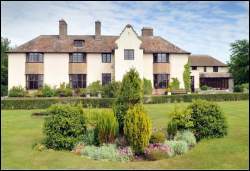 B&B prices from £37.50 per person (2 sharing). Timber-built chalet in a secluded position overlooking Inverkirkaig Bay. 3 miles south of Lochinver. 38 miles north of Ullapool. Sandy beaches nearby. Unspoilt coastal and mountain scenery. 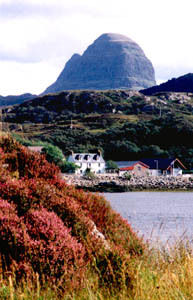 Ideal base for exploring Assynt, NW Sutherland and Wester Ross. 2 bedrooms (1 double and 1 twin). Bathroom with electric shower over a bath. Large open-plan living area which looks down on the bay and beach, just yards away. Kitchen with electric cooker, microwave oven, fridge freezer and washing machine. including electricy, bed linen and towels. Strictly No Smoking. No pets. 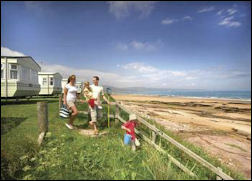 4 star holiday park on a beautiful beach with views of Ben Bhraggie and the Dornoch Firth. Only a short drive from Dornoch. 40 miles north of Inverness. 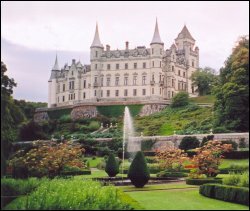 Dunrobin Castle 14 miles. Tain 13 miles. Brora 18 miles. Also nearby: distilleries, boat trips, golf, fishing. Heated indoor pool, sauna, spa bath. crazy golf, tennis, nature trail. Restaurant with lounge area & patio. Bar with big screen TV. Fish �n� chip shop. Wi-Fi access in designated areas. Family entertainment is on offer at night. with 2 or 3 bedrooms, shower, kitchen, lounge, TV. Additional sleeping for 2 in the lounge area. Prices from £219 per week. Wide choice of self catering properties ranging from 2 to 5 bedrooms. Strathnaver, Tain, Thurso, Wick, etc. The Kylesku Hotel (3 stars) is on the shores of Loch Glendhu and Glencoul on the west coast. 8 bedrooms (double, twin, family). Restaurant and bar meals (recommended in the AA Pub Guide and the Michelin Guide to Eating out in Pubs). Open from March to mid October. Tel: 01971 502 231. Mackays Rooms & Restaurant at Durness provides luxury accommodation and traditional Highland cuisine. 6 en-suite bedrooms (single, double, twin, family). 4 Star Small Hotel. Open from March to October. Tel: 01971 511202. The Royal Golf Hotel Dornoch overlooks the Dornoch Firth and is just 50 yards from the first tee at Royal Dornoch Golf Club. Luxury accommodation in 22 en-suite bedrooms. Restaurant (food served from 11am to 9pm). Golf breaks. Tel: 01862 810 283. The Royal Marine Brora offers luxury hotel accommodation (20 bedrooms and a honeymoon suite) with a selection of restaurants, plus a Leisure Club with swimming pool, sauna and spa treatments. All with an 18 hole links golf course on the door step. Golf breaks and spa packages available. Families welcome. Wheelchair accessible accommodation. The hotel can cater for small and large weddings. Tel: 01408 621 252. Self catering is available at the nearby Links Apartments and Links View Villas. 1 Janet Street B&B in Thurso is only 5 minutes' walk from the train station and has 2 bedrooms (double, twin, family). Contact Andrew and Catriona Tait. Tel: 01847 895906. Auld Post Office Bed & Breakfast at Spittal-by-Mybster, near Halkirk in Caithness, has 2 luxury double bedrooms with French doors leading to a private patio. Contact Lynne Read. Tel: 01847 841391. Bank Guest House in Wick town centre with ensuite bedrooms. 3 stars. Tel: 01955 604001. B&B in Brora with 1 family/twin room. Friendly, comfortable stone built house, a few minutes walk from the railway station. Contact Lesley Graham & Andrew Bridges. Tel: 01408 622562. Blar na Leisg is a small hotel near the village of Drumbeg in Assynt on the west coast of Sutherland. Accommodation in 4 ensuite bedrooms. Scottish Tourist Board 5 Star Restaurant with Rooms. Cooking classes available. Self catering in the lochside studio chalet. Contact Anne Strachan. Tel: 01571 833325. Hawthornlea Guest House in Reay (11 miles from Thurso) has 2 double en-suite bedrooms. Guests can chose from a range of traditional, vegetarian or vegan breakfasts. Contact Eileen Sutherland - tel: 01847 811232. Pentland Lodge House is a 4 star guest house with 9 spacious bedrooms in Thurso. Disabled access. Well recommended. Tel: 01847 895103. Suilnamara (Gaelic for 'Sea View') is a family run B&B providing friendly accommodation with 1 twin room and 1 family room (both en-suite). Stunning views over Lochinver harbour. Contact: Rhona Mackenzie, Suilnamara, Lochinver, Sutherland IV27 4LJ. Tel: 01571 844535. Tigh Na Sith Guest House overlooking Lochinver Bay has 3 ensuite bedrooms (double/twin). Contact Patrycja and Nick Matthews. Tel: 01571 844352 / Mobile: 07771 934733. 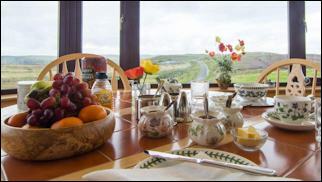 Valleyview House at Murkle, 2 miles from Thurso, is 5 minutes from the Orkney ferry at Scrabster. 3 bedrooms (2 double, 1 twin). Views across the bay to Dunnet Head. Contact Antoinette and Stephen Robertson-Carswell. Tel: 01847 895546. Caisteal Liath offers a variety of self catering accommodation overlooking Lochinver Bay and the mountains. Choice of luxury 1-bedroom chalet with whirlpool bath or 4 star quality 2-bedroom chalet. All facilities including dishwasher, washing machine, TV, VCR, etc. Or you can rent Caisteal Liath House which has 2 bedrooms (1 double, 1 twin), plus all facilities. Contact Sue & John Macleod, Caisteal Liath, Baddidarrach, Lochinver, Sutherland IV27 4LP. Tel/Fax: +44 (0) 1571 844457. Mobile: 07855 555109. B&B also available. Cathair Dhubh: 4-star luxury cottages overlooking Achmelvich Bay just north of Lochinver. Choice of 5 fully equipped cottages (sleeping 4 - 6) on an 80-acre estate. Tel: 01571 855 277. Craiglea at Latheronwheel is a hideaway offering privacy and seclusion in 4 star self catering accommodation for up to 15-20 guests. The accommodation options can be let separately or as a whole: 2 guest houses (each sleeping 5 - 8), a cottage (sleeping 4 - 6) and an indoor leisure area with heated swimming pool. Situated on the coast, 30 miles south of John O�Groats. 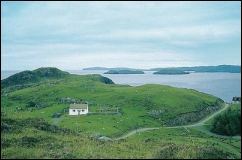 Elig-a-Bhrodan is a 3 bedroom cottage to rent 2 miles from Lochinver. The Glenrossal Estate rents out 2 holiday cottages (sleeping 4 - 6). Salmon fishing also available. Situated near Rosehall (between Bonar Bridge and Lairg). The Hoose has 3 double bedrooms, 2 bathrooms, kitchen and living room. Situated on the harbour at Helmsdale. Highland Glen Lodges offer 4 star self catering in 5 lodges (each sleeping 4 + baby). Set on a wooded hillside near Rogart (between Lairg and Dornoch). Mill House is a 4 star rated crofters cottage at Portskerra on the northern coastline, approximately 20 miles west of Thurso. 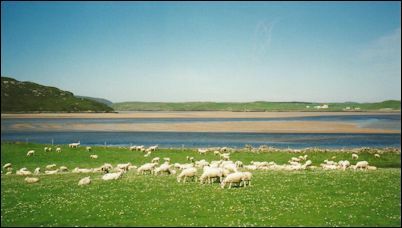 Views of Melvich Bay. Sleeps 4 in 2 double bedrooms. Fully equipped. WiFi. Ocean View is a self catering cottage at Brough, Britain's most northerly mainland village within walking distance of Dunnet Head. 2 bedrooms (1 double and 1 twin), living room, dining kitchen, bath/shower room. Polin Croft is a 1-bedroom cottage just 5 minutes walk from the beach. Located in the far north-west of Scotland, 3 miles from Kinlochbervie. Strathcraig is a crofter's cottage 2 miles from Lochinver. 3 bedrooms (1 double, 1 twin & 1 single). Accommodation and fishing holidays are available in Strath Halladale. The Halladale is a well known salmon river with a season running from 12 January - 30 September. Wild brown trout can be fished in the lochs. Stalking and shooting can also be arranged in addition to other outdoor activities. Acheninver hostel, Achiltibuie has 23 beds (in the Croft House and Bothy). Approach via a rough track. Map Ref: O.S.15 (GR 042056). Ttel: 01854 622719. Helmsdale Hostel. Renovated in 2018. 6 ensuite rooms each sleeping 4 people. Dining area, lounge, garden / barbecue area, laundry room. Discount for groups. Dogs welcome by arrangement. Tel: 07971 516287 or 07971 922356. The Lazy Crofter Bunkhouse at Durness offers quality self-catering accommodation to groups, families and individuals at unbeatable prices. Bunkhouse for up to 20 persons and additional chalet for 5. Contact Robbie and Fiona Mackay. Tel: 01971 511202. Sandra's Backpackers Hostel - 24/26 Princes Street, Thurso. 8 dorms (30 beds in total). Kitchen.TV lounge. Internet access. Bike hire. Tel: 01847 894575. Dunnet Bay Caravan Club Site overlooks the Pentland Firth to Orkney. Toilets and laundry facilities. Open Easter to October. Tel: 01847 821319 (office hours). Thurso Bay Holidays offer a choice of static caravans (each sleeping up to 6 people), equiped with all mod cons. Situated on the Thurso Bay Caravan and Camping Park with views over Thurso Bay looking out to Dunnet Head and Orkney. Contact Tanya Sutherland tel: 01847 895960 / 07833 787 749. 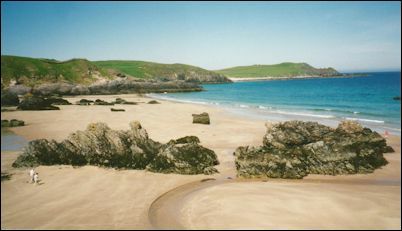 Clachtoll Beach Campsite for touring caravans, camper vans and tents. 2.5 acres. All grass. Warden on site. 6 miles north of Lochinver. Open from May to September. Toilet and shower facilities, dishwashing sinks, chemical disposal point and a public telephone. Dogs are welcome (must be kept on a lead). Written by hillwalker Cameron McNeish and with super photos by Richard Else. Book to accompany the long distance walking route from Lochinver to Tongue, following ancient pathways, stalker's routes and hill tracks. Based on the BBC TV programme. Hardcover. 160 pages. Published 2009. 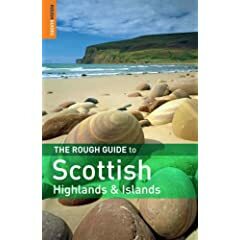 Full of gorgeous photos, this book is a guide to the long distance trail which stretches 200 miles through the remote and spectacular north-west Highlands. Perhaps more for the armchair traveller to enjoy since this is a difficult route to achieve in its entirety in real life. Published in April 2000 by David Paterson. In the same series as his book entitled A Long Walk on the Isle of Skye. Useful book with photos and maps. If you are touring the area, you may find it useful to have the Official Tourist Map for the Highlands of Scotland.